H20 is a unique venue, close to the picturesque Burriana beach in Nerja. Our stylish bar and professional team are dedicated to making your H2o experience chic and perfect. Relax in elegant comfort while sampling our french champagne or fine wines, classic cocktails, coffee or a light snack. All you need to do is bring your own laptop along, which must either have wireless built in or purchase a wifi card from a computer store. The system is secured so you will need to obtain our daily password which we give you when you order your drink. There is no charge for the connection only 1 euro per hour if you need electricity. We are open from 11am till late daily. Why not keep your friends updated whilst your here on your holiday or even work from home in our comfortable cocktail bar. There is also a facility to wireless print. 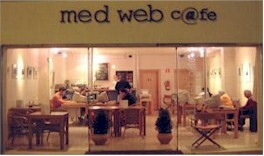 Med Web Cafe Located on Avd. del Medieraneo east of Hotel Monica at the junction.